Week One of NaNoWriMo has come and gone. The euphoria of the challenge has worn off, and now comes the hard part: sticking with the routine. I’ve met my word count every day but one so far, and made up the lost time the next day, so I’m currently on track, but not ahead. That’s all right. I’ve been writing about a thousand words a day (or more) for work, too, so I’m actually rather proud of myself for managing the minimum. This weekend I took a break from staring at my computer screen and went out to the wild wild west of Dalton, MA with my friend Ernesto to ride a horse. I’ve ridden a pony or two as a child, as most animal-loving little girls have, but I’d never been on a full-size steed before, and never had control of the horse, either. It was awesome. I know I don’t look too thrilled in that picture, because it was very cold and I was underdressed (and this was at the beginning of the ride so I still wasn’t sure I was going to make it out alive), but I had so much fun and I really hope to do it again soon. 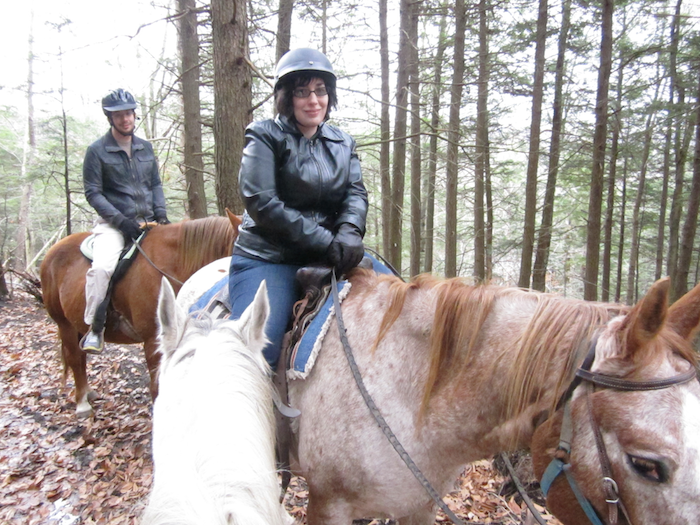 We rode on a forest trail up and down a mountain, complete with Berkshire boulders, fallen logs, and lots of leaf litter, so I learned a lot about how to hold on when a horse is trying to scramble its way up a mini-cliff. 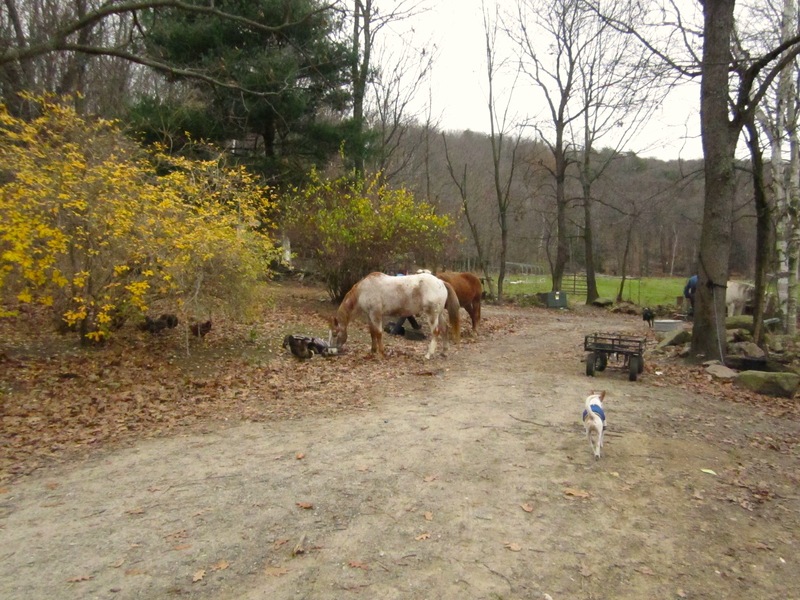 We even trotted on the way home, which was really cool. Now I know that all those movies where people go for ecstatic gallops through flowering meadows aren’t really exaggerating. It really is exhilarating, and we didn’t even go that fast. I also learned a lot about saddle soreness. It’s no joke. Feel free to be as over-the-top as you like in your novels about amateur equestrians. You can’t overstate how unpleasant it is. But it was worth it. But now, it’s back to the daily grind. Pumping out those words and staying focused through weeks two, three and four. And I get Veteran’s Day off this year for the first time ever, so I hope that’ll give me a little boost. I’m really glad I settled on working on SZK, because I’m making a lot of good progress and I feel confident about where the rest of it is headed. Hopefully I’ll come out of this month with a nearly complete first draft, take December to work on an editing project for someone else, then return to SZK in January and have it ready for publication in the early spring. That’s the plan, at least. We’ll see how it goes. How are all my fellow Wrimos doing this month? Optimistic? Destined for failure? Too early to tell? I’ve been having a more difficult time of it so far. With Camp NaNo I had pretty much everything already planned out, complete with chapter synopses. This time I’m trying the “write whatever, plan nothing!” approach and it’s rough. The quality of what I’ve written is definitely lacking. I know there’s always editing later…but it still gets to me. Glad you’re doing well. Keep it up! It’s so hard to let things go when you know they’re not perfect, isn’t it? I keep telling myself that’s part of the fun, though. Doesn’t really work. Maybe this will give you just the inspiration you need to keep going… I posted elsewhere (the actual page for SZK). I’ve finished TLDOTC (think that’s how you shorten it – if not you know what I mean)… and I am now *sweating* on you finishing the next instalment (although actually previous – but will do fine). I’ve helped my father publish several books (he just seems to vomit them up (if you’ll excuse the crass expression), but, since I’ve never written more than a short story or article, my heart goes out to you… But I love reading the work of up and coming stars. Keep up the good work… For me!